Dazian has created a Flame Retardant (FR) Fabric Guide to provide our customers with a comprehensive understanding of FR technologies, FR terminology, and international FR codes, standards and testing methodologies. Dazian has been the pioneer for over 50 years in the development of specialty FR fabrics and materials for the Entertainment, Event, Exhibit and Hospitality Industries. All Dazian fabrics meet the NFPA 701 Small Scale, NFPA 705 Field test and CSFM Title 19 test standards, as well as being approved by both the CA and NY Fire Marshals. We believe that this is only a minimum standard that everyone must comply with. Dazian knows what it takes, both in the laboratory and on location to meet the appropriate Fire codes and the unique demands of your project. We develop and test our products to the most rigorous test procedures and engineer all our new fabrics for maximum Flame Retardant performance. Dazian sets the standard in the industry for high performance FR products that will meet local ordinances and provide superior protection at your venues. Fire prevention in public spaces has received increased attention in recent years. As a result, the Flame Retardant or Flame Resistant properties of fabric has become an integral part of the design and manufacturing decision-making process. 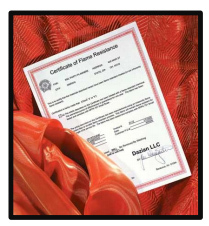 Dazian’s fabrics and materials are, unless otherwise specified, Flame Resistant and meet the standards set forth by NFPA 701 Small Scale, NFPA 705 Field Test and CSFM Title 19 test, the Industry Standards for Flame Resistant Fabrics. They are manufactured with Flame Retardant chemicals either in fiber or fabric form, at the mill, or treated afterwards by a certified applicator. Many conditions affect the flame resistance of a fabric: how the fabric is used; what other fabric or non-fabric components are added to the base fabric; environmental conditions such as sunlight, dust, humidity, etc., length of time in service, sewing, printing, painting or any other added processing steps. It’s the customer’s responsibility to verify that the completed design passes the appropriate Federal, State and Local Fire Codes. Dazian can assist you with our experience and knowledge, but cannot assume responsibility how our customers use and maintain their finished product. Traditionally, IFR fabrics have been defined as fabrics constructed with yarns manufactured with FR additives. 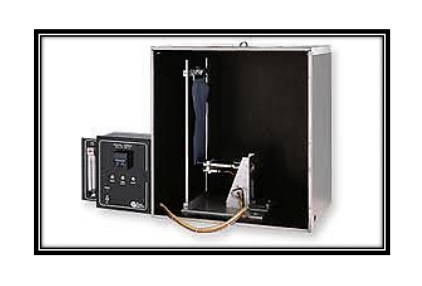 This process imparts Permanent Flame Retardant properties to a fabric over its service life. Over the past 10 years Dazian, and its worldwide network of Fabric manufacturing facilities, have pioneered the development of a new type of FR fabric technology, which permanently bonds FR additives to Polyester fibers in the dyeing and finishing process of fabric formation. Dazian has previously labeled products made with this technology as PFR Polyester fabrics. This process creates Permanent Flame Retardant properties to the fabric over its service life, often with superior FR performance than fabrics manufactured only with FR fibers. All Permanent Flame Retardant fabrics and materials are now labeled as IFR, regardless of the technology used, to minimize customer and Fire Marshal confusion. Fabric has been treated with a non-permanent, registered, FR chemical at the Mill by a certified applicator. This is a topical treatment, usually water soluble, and has limited service life. 100% FR cotton fabrics cannot stand up to high humidity, or washing. Flameproofed polyester fabrics have greater durability and longevity, but in many cases still require subsequent re-treatment. All flameproofed fabrics should be periodically retested and re-flameproofed as required to maintain their FR certification. The typical timeframe is 1-3 years depending upon method and chemicals used in flameproofing, along with environmental, maintenance, and after-processing considerations. Fabric cannot be flameproofed with any treatment methodology without compromising the structural integrity, fabric hand, or visual aesthetic. All printed banners, wall coverings, display booth fabrics, table skirts, tents, awnings, carpeting, window treatments, interior furnishings and vinyl-coated fabrics are required to meet flame retardant standards for homes, offices or other assembly places. Although Dazian routinely tests all of its Fabrics and Materials to NFPA 701 Small Scale, CSFM Title 19, and NFPA 705 Field Test, a number of other industry tests are performed based upon fabric application and construction, code requirements, country of usage, and type of fabric substrate. The following summary outlines the most frequently requested test procedures, along with criteria for usage, test methods, and standards. – Also applies to table skirts, linens, display booth separators, textile wall hangings. – Also applies to any textile or textile product. Expanded application to any textile product that is decorative or hung in public spaces or tents. B2 test used if fabric fails B1 test.